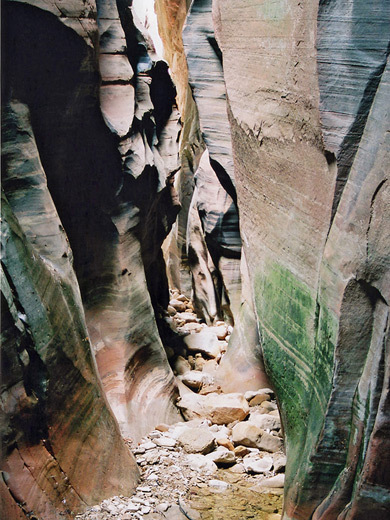 Echo Canyon is one of the best and most easily accessible slot canyons of Zion National Park, joining the Virgin River a few miles south of the end of the park road at the Temple of Sinawava, just before the start of the Zion Narrows. 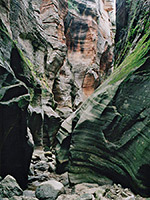 The lower part of the canyon drops very sharply towards the main valley in a series of steep steps, narrow channels and circular potholes carved in the rock, but the drainage becomes temporarily wider and more level upstream. 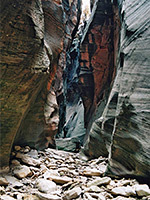 After half a mile further up the canyon, the cliffs close in to form a dark and very deep slot just a few feet wide, with smooth red and grey rock walls rising high above a rocky, boulder-strewn floor usually containing many pools of murky water. 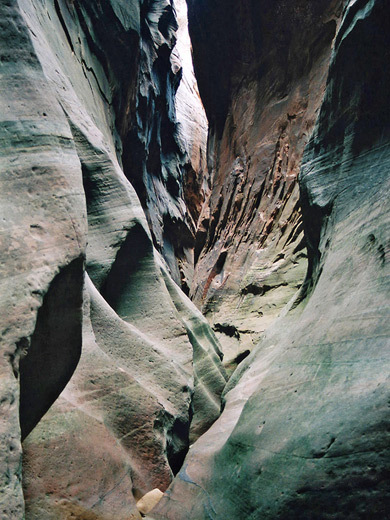 The Observation Point Trail follows the main canyon far above the slot, but about half of the narrows can be explored fairly easily from below; to see the whole length requires rappelling, starting from the top. Echo Canyon is reached from a junction off the well-used trail to Hidden Canyon and Observation Point, which starts from the Weeping Rock parking area 2 miles before the end of the Zion Canyon Scenic Drive. This is now only reachable by the free park shuttle. 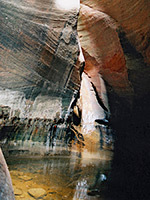 No permit is required to explore the lower part of the canyon, just a standard $25 Zion National Park entry fee, but one is required if descending the whole length as this involves rappelling. 18 views of Echo Canyon. TopoQuest topographic map of Echo Canyon. From the parking area, the trail ascends steeply up the side of Zion Canyon for about 1 mile then divides; the left (north) branch to Observation Point joins Echo Canyon above the steep lower end, and follows it at water level for a short distance, before eventually climbing to the top of the cliffs and meeting other cross-country trails, while the other branch heads towards Hidden Canyon. The path runs alongside the canyon floor for about half a mile, through a section that is flattish and still relatively wide, but then the rocky walls around the watercourse close in abruptly. The route begins to ascend steadily, towards the higher section of the canyon which is wide and open, with trees and bushes although the narrow crack is still visible to one side, and looks rather dark and dangerous when viewed from directly above. The slot can be entered close to where the trail parallels the streambed but just upstream are some deep potholes that contain murky water all year, several feet deep, so an easier start point is a bit further along, as the path starts to ascend, just before a bridge over a short, overgrown ravine. The main gorge is reached by scrambling down the side and wading across a shallow pool, from where the canyon turns south and enters a longish straight section between high, vertical cliffs, usually with a small stream flowing, across a floor of pebbles and boulders. The passage narrows a little, bends to the east and ends in a pool beneath a chokestone, followed by another pool with higher chokestone and a possible log jam, up to 10 feet high. Above here, the canyon enters the main narrows - about half a mile of deep, mostly dark passageways containing many other pools of cold water, generally up to 3 feet deep, and pouroffs up to 6 feet. For most of the canyon, the cliffs overhang above creating a damp, dark environment, made more oppressive by the dark red/grey walls, tinged with green moss in the few places where sunlight can penetrate, so the canyon is not pretty as such but very impressive, and just a little intimidating owing to the tallness of the cliffs, the sombre conditions and the frequent signs of the huge floods that occasionally pour through - logs wedged above, broken boulders, deep mud patches. The walls are smooth near stream level but jagged and angular higher up, where they look quite old and weathered. 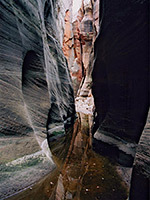 The canyon has one short, open section with large boulders where the sun shines, followed by more darkness. The easy part ends with a circular pool around 4 feet deep beneath a quite narrow pour-off - the last of the places that may need rappelling if descending from the top end. A full exploration involves hiking up the trail for another mile and a half, to a point where the walls relent sufficiently to allow entry, then proceeding downstream by means of up to 10 rappels over dryfalls, and swimming through deep potholes. The trip is only possible starting quite late in the season owing to large amounts of snow that fall into the narrows from the sheer slopes of Cable Mountain; some patches persist until midsummer.